In our original report on the state of Roslindale’s playgrounds, we demonstrated the neighborhood’s clear need for more and better playgrounds. Here we describe the importance of improvements to Healy Field specifically. Healy Playground is a woefully substandard playground located in a dense and economically disadvantaged neighborhood. Although the city is slated to renovate Fallon Field playground within the next few years, there is currently no timetable for playground improvements at Healy Field. While this wait is due to the Parks Department’s normal renovation schedule, we believe that the need for these improvements is just as urgent. The Healy Playground is built on a scale that would be expected in a smaller “pocket park” rather than a large park that is centrally located in a busy neighborhood. Although the playground area is a decent size, the play structures (pictured above) are both small, making limited use of the available space. The structures are designed for only a limited range of ages and an unimaginative breadth of use; parents report that their children quickly outgrow the structures. There are no swings or other moving play structures such as seesaws. To use the closest public swingset a child must travel almost a mile to Fallon Field, which will be on foot for a significant portion of the population. Population density – among children especially – is very high around Healy Field. 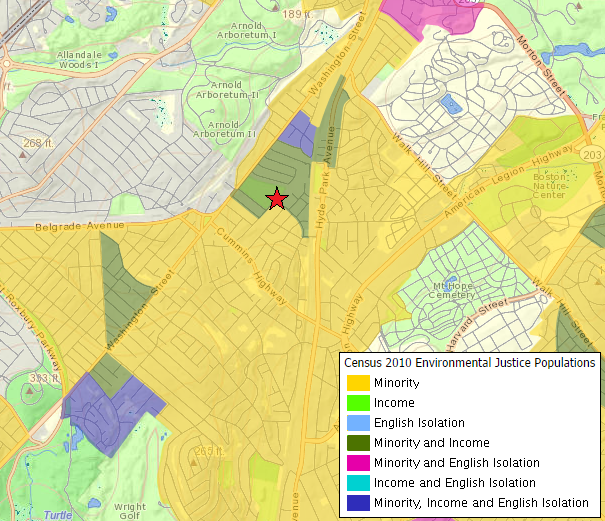 The following map (published by the Boston Redevelopment Authority) demonstrates that the area immediately surrounding Healy Field is among the most densely populated areas in all of southwestern Boston. 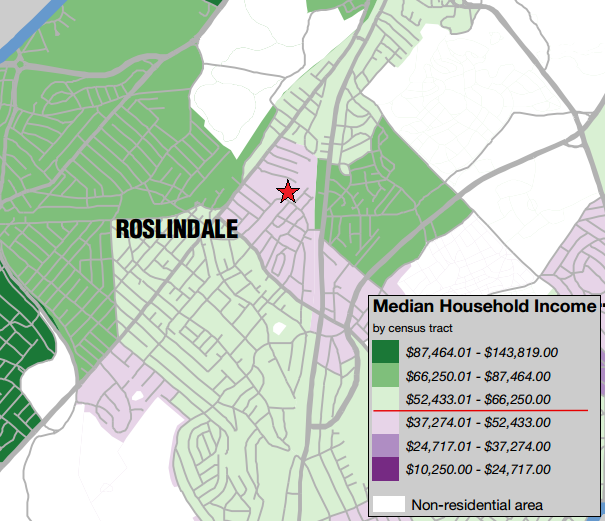 The Healy Playground is in the epicenter of Roslindale’s largest sub-median household income neighborhood. According to the BRA map identifying median household incomes, this same area is one of the few areas in the southwestern part of the city with a median household income lower than the city’s. 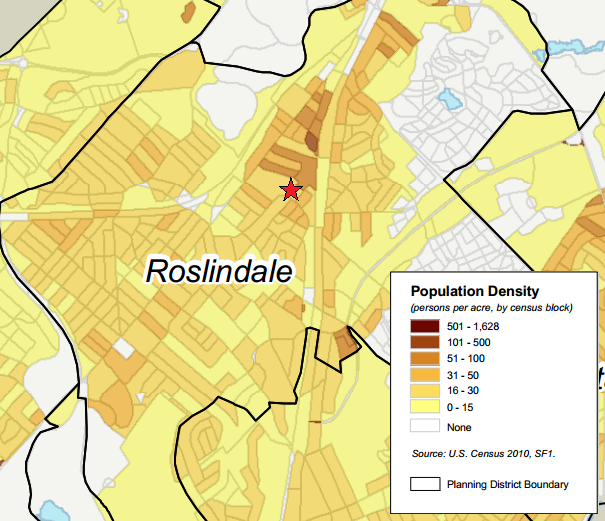 Taken together, we see that there is no area in Roslindale with a greater combination of density, concentration of children, and community need. The lack of play structures in the area surrounding Healy Field is an ongoing problem whose history can be traced back at least as far as the 1970s. An existing Parks Department property, Pagel Playground, is located just across the train tracks from this neighborhood. Despite its name, there is no playground structure at this park (its primary use is as an artificial turf soccer field). And while it was once easily accessible to Roslindale residents who live to the west of the train tracks, the pedestrian tunnel that made that connection has long since been closed. Looking back further, the city at one point had a playground which included a water feature at the intersection of Hyde Park Avenue and Blakemore Street. This playground would have served many residents of Roslindale who are now left with Healy Field as their closest playground. Unfortunately, the city paved the playground to reduce maintenance costs; the playground soon became unpopular due to the heat and safety issues, and was eventually closed. The Roslindale district has been the recent recipient of large capital expenditures for its local playgrounds. It has become increasingly apparent that the continued expenditure of capital funds for parks and recreation sites in this district will be largely wasted unless adequate and regular maintenance is increased so that minor repairs do not become capital expenditures or eyesores in the short term causing neighborhood decline and loss of community pride. Indeed, rather than the additional play spaces or increased maintenance suggested in the report, Roslindale has seen playgrounds in the area near Healy Field disappear in the 37 years since the report’s release. To add insult to the neglect suffered by the community, local residents lost use of the playground – even in its substandard state — during the 2013 Flaherty Pool renovation. The city closed the playground for most of a year and, surprisingly, did no improvements to the playground site at the same time. It is important to remember that Healy Field is much more than just a playground site. As a large park located close to both Roslindale Square and a densely populated residential area, it is the neighborhood park with the most potential for community play for all ages. The park already features ball fields, basketball courts, and a pool, but even still there is room for so much more. Beyond just an area for children’s play, neighbors envision a park that is welcoming for dog walkers, movie nights, local sports teams, gardening, art installations, and more. Perhaps, for example, the park could be slightly reconfigured to include a walking track circling the perimeter, with a community garden adjacent to the playground. Our hope is that, as the city and the community consider upgrades to the playground, we also consider how that playground can be integrated into the best recreational experience possible for all. The playground density numbers provided in our original report on Boston’s playgrounds show that overall, the city does a reasonable job of providing playgrounds to even its most densely populated areas. 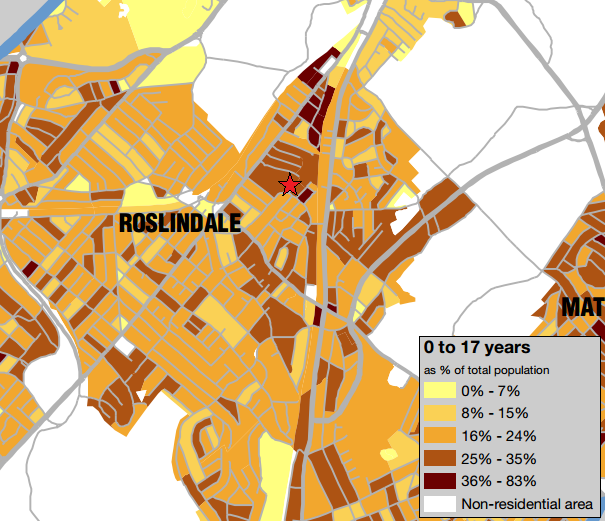 As we noted in that report, Roslindale – in contrast to the city’s other neighborhoods – is poorly served by playgrounds. It is especially troubling that amid this shortage, the playground in Roslindale that is best situated to serve the most children is so inadequate. Based on location alone, Healy Field has the potential to be the centerpiece of Roslindale’s play scene, but is falling well short of that potential. 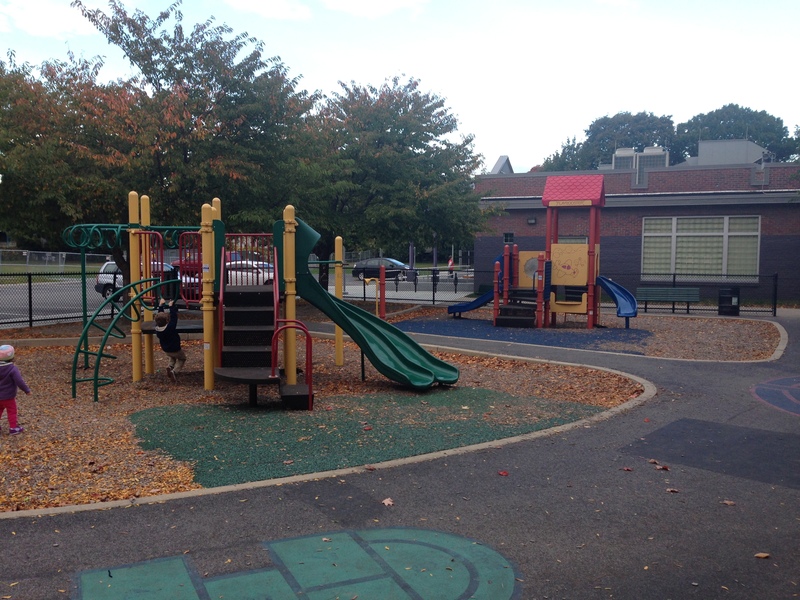 Its location makes it particularly important to Roslindale’s play needs, and so comprehensive improvements to the playground – while still leaving Roslindale short of playspaces overall – would have a major impact on the community. We are asking that the city act now to reverse decades of decline in Roslindale’s playgrounds, and make Healy Field into the recreational facility that its children deserve.